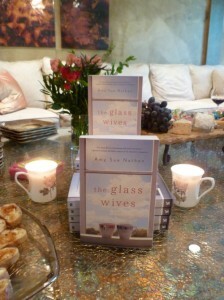 When it was time to think about celebrating the arrival of The Glass Wives, I thought I didn’t want to have a party. Then I realized that you only have your first book come out ONCE (although author Melanie Benjamin tells me every launch feels like a debut). 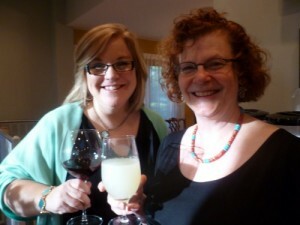 A fabulous friend generously offered to host a party for me at her home. I made a list of the people I wanted at the party. The list was short. Yes, her house could have accommodated a larger crowd, but I did not want to celebrate with a lot of people, only the people, for the most part, who were real friends and had be truly supportive through the process of writing and seeing my book through to publication. The people who were there before the book and would be there after the book. The people who would have been there if there were no book. And that’s what made it perfect for me. And for the first time in a long, I did allow it to be about me. Actually, most of my friends insisted upon it. I knew were the right people to invite. 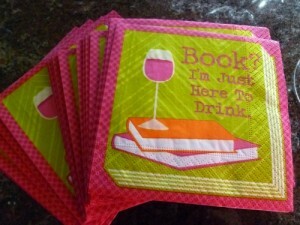 First, you’ll need two packages of the best napkins on the planet. Then, you’ll want to find a wonderful friend and host. Slowly add her homemade tea cup candles to the table-scape. 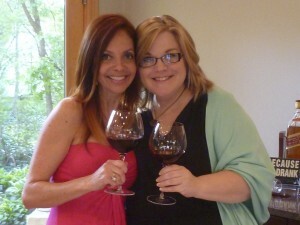 Then, add one BFF who flew in from 800 miles away. 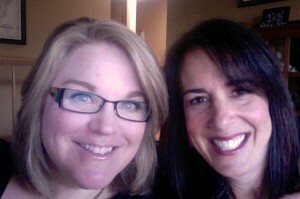 Mix in one critique partner you met online, but now count on in real life. Stir in a huge stack of books to sign. Approximately thirty, or to taste. Sprinkle with great friends and one amazing daughter. Top with wine and food (and rugelach favors tied with a bow) and enjoy! Looks like fun, Amy! Thanks for sharing your private evening with us! Oh, man, I would have DRIVEN MY CAR to get there, if I’d only known! Congratulations, Amy! I love seeing you surrounded by so many loving friends. What fun! I’m so excited for you, Amy! Looks like a fabulous time. I just finished Glass Wives. Love, love loved it. You desired to have a party all about you. I raise a toast to you. Congratulations. Perfect ingredients put together in the right proportions! Congratulations, Amy! Looks like a great one to me! Mazel tov, Amy! You deserved a party and it looked great. That’s awesome, Amy. And the fun continues! Congratulations from someone who doesn’t even know you. It does look lovely. A well-deserved recognition of your persistence and creativity. This is one of the most encouraging sites I have visited. 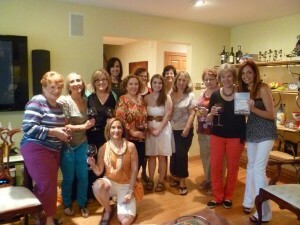 A new book out, great traffic, and a happy looking of party goers. Can’t wait to read The Glass Wives. Amy, congratulations on the launch of your debut. I know that how wonderful it must be to finally realize your dream. Wishing you great success! It’s wonderful to see you enjoying yourself. You deserve it! 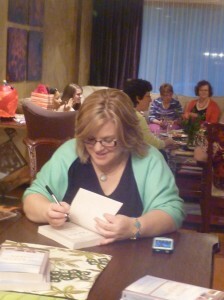 And thank you for providing the how-to for a book release day party. I’ve been wondering what I’m supposed to do on a certain Tuesday in late August.Cheers!